Mira! Estoy Viviendo en Mexico! : Dónde? 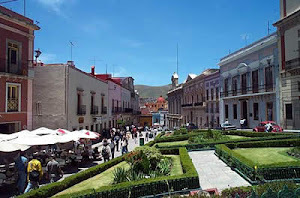 Guanajuato lies in the central heart of Mexico, 380 kilometers northwest of Ciudad de Mexico (Mexico City), and east of Puerto Vallarta. In 1558, veins of silver were discovered, resulting in peaks of economic realization as well as repression. I was one of the richest cities in Mexico, attracting the Spaniards. In 1810, the wealthy and poor of Mexico united to defeat the Spaniards at Alhondiga de Granaditas. If you look solely at the architecture, you'd think you were in a medieval European city. Guanajuato is located in the Bajio region, nestled at the bottom of a big bowl shaped ravine surrounded by hills and mountains. With a population of 160,000, its people are famous for a long tradition of music, or callejoneadas. It is also well known for its college town environment. UNESCO declared Guanajuato and its silver mines a world heritage site in 1988. The city was originally built over a river which flowed through tunnels under it. This caused a lot of flooding (I imagine much like Venezia, Italia) so a dam now exists to redirect the water into underground caverns. The former tunnels in which water used to flow, has now been made into a road underground for car travel. The city is far away from Cancun and Cuernavaca--perfect for learning Spanish! My school is in the city center in the "barrio Pastita." The method of teaching is focused on socializing and also increasing knowledge of Mexican culture. I'm really excited about meeting my host family, other students at school, and improving my Spanish.